Whitcombe’s sasquatch calls to mind reports of a sighting of a ‘wild man’ on Quadra in 1905. The Pidcock family of Quathiaski Cove had just sat down for a late evening meal at 10:00 p.m. when a “ghastly face” peered through the window. “The face was covered with black hair,” said the Vancouver World News, “only a small portion of skin being visible.” The creature uttered “a diabolical scream” and vanished, though its prints remained in the soft earth of a flower bed beneath their dining room window. The family heard similar screams through the night and the next day they found footprints along a stream. That evening the elder sons lay in wait outside, behind a pile of hay, and at 10:30 p.m. they heard “horrible yells” from the creek. With storm lanterns in hand, they hiked about half a mile upstream, where they came upon “a tall man, who was entirely naked, except for a few rags hanging from a belt at his waist.” His body was covered with long hair. When one of the Pidcocks raised a rifle to his shoulder the creature dove into the creek and swam to the other side. Once there he cried out ‘don’t shoot,’ and plunged into the bush and disappeared. Nothing more was seen on Quadra of this ‘wild man,’ or ‘mowgli,’ named for a Rudyard Kipling tale of the day. There were, however, many other sightings in the mid-Vancouver Island region, most of them centered around Parksville, Union Bay and Alberni. Some theorized it was a gorilla that had been destined for a zoo but was shipwrecked some years before. Others suggested it was a man who’d gone missing while hunting, or perhaps another man who’d disappeared after a bout of Gold Rush-induced insanity in the mid-1800s. 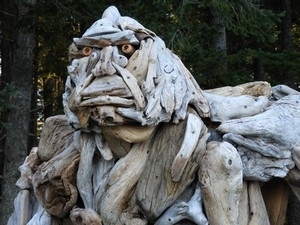 The most credible of the eye witness accounts came from four hunters near Qualicum, who saw a man-like creature with a beard and long body hair. Renown timber cruiser Mike King, who often crossed Vancouver Island on his own, also gave a cogent report. 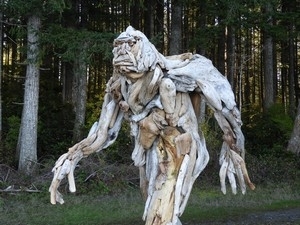 He was behind Campbell River when he came upon a creature of “ape-like proportions” squatted down by a stream, where it was cleaning two bundles of wild onions. “I thought it was a bear at first,” said King, “but when it heard me and straightened up I brought my rifle up to my shoulder for it was the strangest sight I ever expect to set eyes on.” The creature was over six feet tall and covered in exceptionally long coarse black hair, said King. “Its small eyes glared at me in surprise for an instant. It was just over two hundred yards distant, and King kept it covered with his rifle. “After glaring at me for a moment it uttered a cry—a half-human sort of grunt—and grasping a branch, hoisted itself up the bank and ran away.” King offered to lead a search party to find the wild man but there were no takers. To read more historical accounts of sasquatch sightings check the Colonist newspaper’s free online archives at http://www.britishcolonist.ca/. (Use the “advanced search” function, with ‘wild man’ in the “exact phrase” category.) The story about the Quadra Island sasquatch comes from the Vancouver World News of November 29, 1905, p. 1, which is available through Newspapers.com.